Comply Isolation Series tips are made out of patented viscoelastic memory foam right in the U.S. By being an astounding 30 times softer than standard silicone rubber earphone tips, your ears won’t be plagued by achy listening fatigue. Instead you’ll be able to listen to your entire music library without hoping for a tiny ear massage afterwards. Silicone rubber earbuds are thin, flimsy and unforgiving. Most come as one-size-fits all, and if there’s one thing we know it’s that no two ear canals are the same. Comply Foam offers 600% better grip than rubber earbuds. Thanks to the extreme adaptability of the memory foam, superior attenuation and a flexible core, Isolation 600 earbuds are designed to create the perfect seal with your specific ear canal. So jump, move, sweat and swing—those buds aren’t going anywhere. The cleverly designed shape of the Isolation 600 Series Foam Tips means that sound is directly funneled into your ear. Don’t stress missing a beat ever again. With a focus on a complete seal of the ear canal, you’ll experience sound isolation at its finest. 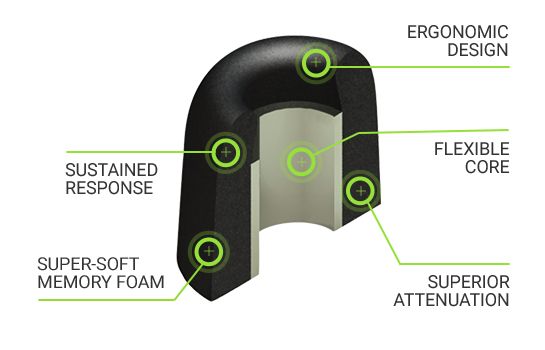 The thick memory foam provides two times more decibel reduction than silicone tips, meaning external sound is no match now. Without the infiltration of ambient noise, your music will truly shine as low basses and high notes are finally able to cut through the clutter.